There’s a great deal of resistance out there to tracking your spending. I suspect that’s either because people think it’s going to be tedious, or because they don’t want to “have” to worry about every little thing — like getting a candy bar from the vending machine. In other words, it feels restrictive, and like a chore. That can shock you into action. Let me give you an example of what I mean. A few weeks ago, I started using a pedometer. For the first week, I just went about my days like normal, and made a note of the number of steps at the end of each day. My goal was to see what was a typical number of steps for me. It turned out that I was walking anywhere from 2000-2500 steps a day. Which puts me in the sedentary range. (Ouch.) But what really got me was the weekend. I had no idea I was such a slug! I didn’t even hit 1,000 steps on that first Saturday. And all it took for me to change was a little bit of tracking. Like that pedometer, tracking your spending is a tool that can allow you to see what’s going on in your life. You may think that you’re using your money the way you’d planned, but you will only know for sure if you actually check. And if you find out that you aren’t doing quite what you’d intended with your money, you can use that tool to verify that you’re making the changes you want to make. Tracking your spending isn’t about being restrictive, or about getting a money-related chore done. Instead, it’s about getting information — and then using that information to help you become successful. You don’t have to do it forever either, although you might want to because it can actually become fun. At a minimum, I’d suggest doing a little spending checkup once or twice a year. I love tracking my spending. I dont really think everything has to be tracked like maybe a candy bar unless you tend to spend that much on side items. I think one of the reasons people tend not to track is because the dont want to be held responsible for the money they spend. Out of sight out of mind. I know how hard it is to start tracking spending. You don’t really want to see how much money you’re spending on eating out, or paying to the credit cards when the balance never goes down. But you can NOT get on a budget or make a change to your financial goals or really do anything to change your financial situation if you don’t know exactly where your money is currently going. I still track (and track publicly in my Sunday Evening Posts) because it helps me know where we spent money. I no longer look at the account and go “ack! I thought we had a couple hundred more in there!” And trust me, that makes it worth it in and of itself. Tracking your spending is the first step to solving an overspending problem. Yup. It’s also a first step to awareness of what you’re doing with your money in general, and toward making your money do what YOU want it to do. Great comparison! Thanks for sharing. With our spending, I find it has helped so much to only use cash for the “wants” category. Our other categories are needs, debts, and savings, and those are automatically deducted on a fortnightly basis. I think a lot of budgeting is figuring out what works for you and how to make it a seamless part of your life! And congrats on getting a pedometer. I walk 3 miles a day (from home to work and back) at a minimum. If there’s any way to walk a bit more for errands, those steps really add up! The nice thing now? There are free options to track your spending, so you don’t have to log into every account or create a complicated spreadsheet if you want to keep things in check. What’s your favorite free option? For two years, I was obsessive about tracking my spending – I literally saved and logged every single receipt from every single purchase, even the $1.62 it cost to buy the Sunday paper. I’ve gotten away from that, but still make a point to check my credit card and bank accounts frequently to make sure I’m staying at my monthly targets. I’m still obsessive, but since I very rarely use physical cash for anything, it’s not difficult to track exactly. Great analogy. People believe something about themselves, like “Oh I don’t spend that much shopping for X.” But until they track it, they don’t really know and probably over estimate or under estimate the results. I guess you could say we aren’t good at estimating! Oh that’s for sure! I think people in general are very bad at estimating. Jackie, I was put on a pedometer years ago because of some meds I was taking. They wanted to make sure that I was moving enough to flush these (poisons) chemo out of my system days after they were taken. No problem. I had to chart my daily steps and then after 30 days I went back to the specialist and they came in and said we need you to use a different model the one you were using wasn’t working right. Okay so different model, track everyday. Back up to doctor, give him the chart. Now the doctor ,two nurses and a physical therapist are in the office asking questions? They did not realize how much I move! At that time I was running 3-5 miles a day. One day I had logged 17 miles because we had a show at a theater with two flights of steps. Try getting 108 kids up and down those during a rehearsal and two shows. The end result was they upped my medication as I was working it off too fast:(. Now if I could just get into the habit of tracking spending. I hate it. But I am trying again. Wow I’m not surprised they thought your pedometer was broken with 17 miles in one day! But I can see that happening with all you do. Good thing they finally thought to ask you about your activities. What do you hate about tracking? Tracking all the money coming in and out of your life is more than insightful into your spending habits – and I, like others who responded love to track. But I never considered tracking (counting) calories. Like your experience with the pedometer, I was shocked to see the vast amounts of calories I was consuming each day. Always being a thin person, I never once even looked at caloric intake – but when I did – wow. Thin doesn’t always equate to being fit, so I have cut back on all my portions. Numbers are so powerful. Thanks for the great post. Calories is another thing I’ve spent time tracking, only to discover that I wasn’t eating enough, and that apparently my body thought it was starving so stored up fat every chance it got. I’m sort of new at tracking my expenses and am currently attempting a ‘No spending Challenge for the month of February’. Tracking expenses will help, because you’ll start to see what your expenses really ARE, and what you’re spending on beyond those. The key I think is to not disregard what you’re doing because it was “unusual”. I finally figured out that every month is an unusual month, which means…they aren’t. 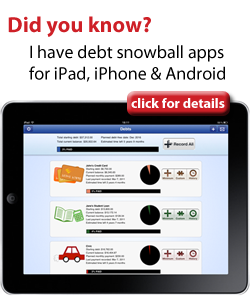 You may want to check out my other blog about debt (www.thedebtmyth.com) btw. I’m not I understand what you’re asking about how to coordinate expenses though. Do you mean when they are due? Tracking my spending is the key to my sanity! It lets me know that I will end the month with plenty of money for beginning of the month bills. It also lets me see when I’ve been depriving myself and when I need to be more careful. I use the Ledgerist app on my Android phone to record each purchase by type (cash, checking, credit), then use a very detailed spreadsheet [the MoneyMinder(tm)] to manage my spending plan. As for Carla, the only way to get (and stay) out of debt is to build your emergency fund first. Grow it to $1000 before you start paying down your balances. Good point on the emergency fund too!